An interesting game for Stapac (12-1) which hosted in Jakarta 3rd ranked Pacific Caesar (4-7). First ranked Stapac managed to get a 14-point victory 77-63. Stapac outrebounded Pacific Caesar 48-25 including a 19-7 advantage in offensive rebounds. Worth to mention a great performance of American forward Savon Goodman (198, college: Shaw) who helped to win the game recording a double-double by scoring 20 points, 11 rebounds and 4 assists. The other American import guard Kendal Yancy (190-94, college: Texas) contributed with 19 points and 5 rebounds (on 8-of-10 shooting from the field) for the winners. Stapac's coach Giedrius Zibenas used entire bench which allowed the starters a little rest for the next games. 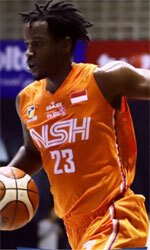 Muhammad Hardian (189-93) replied with 26 points and 6 rebounds for Pacific Caesar. Stapac have an impressive eight-game winning streak. They maintain first position with 12-1 record. Pacific Caesar at the other side keeps the third place with seven games lost. They share the position with Siliwangi. Stapac will have a break next round, and it should allow them to practice more before next game. Pacific Caesar will play at home against Siliwangi and it may be a tough game between close rivals. The game in Salatiga supposed to be also worth to mention about. Fourth ranked Bima Perkasa (6-6) played at the court of 5th ranked Satya Wacana (4-9). Bima Perkasa smashed Satya Wacana 79-58. It ended at the same time the two-game winning streak of Satya Wacana. American players dominated the game. Worth to mention a great performance of guard David Seagers (188-88, college: Dowling) who helped to win the game recording a double-double by scoring 25 points, 12 rebounds, 5 assists and 5 steals (made all of his nine free throws !!!) and David Atkinson who added 28 points and 12 rebounds during the contest. At the losing side guard Madarious Gibbs (185-93, college: Texas Southern) responded with 22 points, 6 rebounds and 5 assists. The winner was already known earlier in the game, so both coaches allowed to play the bench players saving starting five for next games. Bima Perkasa moved-up to second place. Satya Wacana at the other side keeps the fifth position with nine games lost. Bima Perkasa will play against league's leader NSH in Jakarta in the next round and it will be for sure the game of the week. Satya Wacana will have a break next round. The game in Salatiga supposed to be also worth to mention about. Fourth ranked Bima Perkasa (6-6) played at the court of 5th ranked Satya Wacana (4-9). Bima Perkasa smashed Satya Wacana 79-58. It ended at the same time the two-game winning streak of Satya Wacana. Bima Perkasa made 20-of-24 charity shots (83.3 percent) during the game. They outrebounded Satya Wacana 48-35 including 20 on the offensive glass. American players dominated the game. Worth to mention a great performance of guard David Seagers (188-88, college: Dowling) who helped to win the game recording a double-double by scoring 25 points, 12 rebounds, 5 assists and 5 steals (made all of his nine free throws !!!) and forward David Atkinson (203-91, college: Salem Intern.) who added 28 points and 12 rebounds during the contest. At the losing side guard Madarious Gibbs (185-93, college: Texas Southern) responded with 22 points, 6 rebounds and 5 assists and forward Raymond Miller (204-88, college: CS Fullerton) produced a double-double by scoring 12 points and 15 rebounds. The winner was already known earlier in the game, so both coaches allowed to play the bench players saving starting five for next games. Bima Perkasa moved-up to second place. Satya Wacana at the other side keeps the fifth position with nine games lost. Bima Perkasa will play against league's leader NSH in Jakarta in the next round and it will be for sure the game of the week. Satya Wacana will have a break next round. An interesting game for Stapac (12-1) which hosted in Jakarta 3rd ranked Pacific Caesar (4-7). First ranked Stapac managed to get a 14-point victory 77-63. Stapac outrebounded Pacific Caesar 48-25 including a 19-7 advantage in offensive rebounds. Worth to mention a great performance of American forward Savon Goodman (198, college: Shaw) who helped to win the game recording a double-double by scoring 20 points, 11 rebounds and 4 assists. The other American import guard Kendal Yancy (190-94, college: Texas) contributed with 19 points and 5 rebounds (on 8-of-10 shooting from the field) for the winners. Stapac's coach Giedrius Zibenas used entire bench which allowed the starters a little rest for the next games. Muhammad Hardian (189-93) replied with 26 points and 6 rebounds and American forward Qarraan Calhoun (203-86, college: Houston) added 19 points and 8 rebounds in the effort for Pacific Caesar. Stapac have an impressive eight-game winning streak. They maintain first position with 12-1 record. Pacific Caesar at the other side keeps the third place with seven games lost. They share the position with Siliwangi. Stapac will have a break next round, and it should allow them to practice more before next game. Pacific Caesar will play at home against Siliwangi and it may be a tough game between close rivals.